The cloud management gateway (CMG) provides a simple way to manage Configuration Manager clients on the internet. By deploying the CMG as a cloud service in Microsoft Azure, you can manage traditional clients that roam on the internet without additional infrastructure. You also don't need to expose your on-premises infrastructure to the internet. This feature was first introduced in version 1610 as a pre-release feature. Beginning with version 1802, this feature is no longer a pre-release feature. Deploy the CMG cloud service to Azure. Add the CMG connection point role. Configure the site and site roles for the service. Once deployed and configured, clients seamlessly access on-premises site roles regardless of whether they're on the intranet or internet. This article provides the foundational knowledge to learn about the CMG, design how it fits in your environment, and plan the implementation. Install the Configuration Manager client on Windows 10 devices over the internet. Using Azure AD allows the device to authenticate to the CMG for client registration and assignment. You can install the client manually, or using another software distribution method, such as Microsoft Intune. New device provisioning with co-management. CMG isn't required for co-management. It helps complete an end-to-end scenario for new devices involving Windows AutoPilot, Azure AD, Microsoft Intune, and Configuration Manager. Remote/branch office devices that are less expensive and more efficient to manage over the internet than across a WAN or through a VPN. Mergers and acquisitions, where it may be easiest to join devices to Azure AD and manage through a CMG. By default all clients receive policy for a CMG, and start using it when they become internet-based. Depending upon the scenario and use case that applies to your organization, you may need to scope usage of the CMG. For more information, see the Enable clients to use a cloud management gateway client setting. The CMG cloud service in Azure authenticates and forwards Configuration Manager client requests to the CMG connection point. 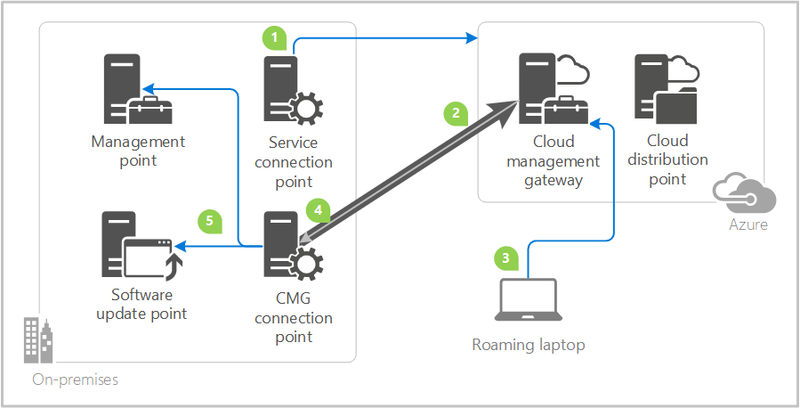 The CMG connection point site system role enables a consistent and high-performance connection from the on-premises network to the CMG service in Azure. It also publishes settings to the CMG including connection information and security settings. The CMG connection point forwards client requests from the CMG to on-premises roles according to URL mappings. The service connection point site system role runs the cloud service manager component, which handles all CMG deployment tasks. Additionally, it monitors and reports service health and logging information from Azure AD. Make sure your service connection point is in online mode. The management point site system role services client requests per normal. The software update point site system role services client requests per normal. Internet-based clients connect to the CMG to access on-premises Configuration Manager components. The CMG uses a certificate-based HTTPS web service to help secure network communication with clients. Internet-based clients use PKI certificates or Azure AD for identity and authentication. A cloud distribution point provides content to internet-based clients, as needed. Starting in version 1806, a CMG can also serve content to clients. This functionality reduces the required certificates and cost of Azure VMs. For more information, see Modify a CMG. Starting in version 1802, you can create the CMG using an Azure Resource Manager deployment. Azure Resource Manager is a modern platform for managing all solution resources as a single entity, called a resource group. When deploying CMG with Azure Resource Manager, the site uses Azure Active Directory (Azure AD) to authenticate and create the necessary cloud resources. This modernized deployment doesn't require the classic Azure management certificate. The CMG wizard still provides the option for a classic service deployment using an Azure management certificate. To simplify the deployment and management of resources, using the Azure Resource Manager deployment model is recommended for all new CMG instances. If possible, redeploy existing CMG instances through Resource Manager. For more information, see Modify a CMG. Starting in version 1810, the classic service deployment in Azure is deprecated for use in Configuration Manager. This version is the last to support creation of these Azure deployments. This functionality will be removed in the first Configuration Manager version released after July 1, 2019. Move your CMG and cloud distribution points to Azure Resource Manager deployments before this time. Create the CMG at the top-tier site of your hierarchy. If that's a central administration site, then create CMG connection points at child primary sites. The cloud service manager component is on the service connection point, which is also on the central administration site. This design can share the service across different primary sites if needed. You can create multiple CMG services in Azure, and you can create multiple CMG connection points. Multiple CMG connection points provide load balancing of client traffic from the CMG to the on-premises roles. To reduce network latency, assign the associated CMG to the same geographical region as the primary site. Internet-based clients and the CMG don't fall into any boundary group. Other factors, such as the number of clients to manage, also impact your CMG design. For more information, see Performance and scale. Contoso has a standalone primary site in an on-premises datacenter at their headquarters in New York City. They create a CMG in the East US Azure region to reduce network latency. They create two CMG connection points, both linked to the single CMG service. As clients roam onto the internet, they communicate with the CMG in the East US Azure region. The CMG forwards this communication through both of the CMG connection points. Fourth Coffee has a central administration site in an on-premises datacenter at their headquarters in Seattle. One primary site is in the same datacenter, and the other primary site is in their main European office in Paris. One CMG in the West US Azure region. One CMG in the West Europe Azure region. On the Seattle-based primary site, they create a CMG connection point linked to the West US CMG. On the Paris-based primary site, they create a CMG connection point linked to the West Europe CMG. As Seattle-based clients roam onto the internet, they communicate with the CMG in the West US Azure region. The CMG forwards this communication to the Seattle-based CMG connection point. Similarly, as Paris-based clients roam onto the internet, they communicate with the CMG in the West Europe Azure region. The CMG forwards this communication to the Paris-based CMG connection point. When Paris-based users travel to the company headquarters in Seattle, their computers continue to communicate with the CMG in the West Europe Azure region. Fourth Coffee considered creating another CMG connection point on the Paris-based primary site linked to the West US CMG. Paris-based clients would then use both CMGs, regardless of their location. While this configuration helps load balance traffic and provide service redundancy, it can also cause delays when Paris-based clients communicate with the US-based CMG. Configuration Manager clients aren't currently aware of their geographical region, so don't prefer a CMG that's geographically closer. Clients randomly use an available CMG. An Azure subscription to host the CMG. An Azure administrator needs to participate in the initial creation of certain components, depending upon your design. This persona doesn't require permissions in Configuration Manager. At least one on-premises Windows server to host the CMG connection point. You can colocate this role with other Configuration Manager site system roles. The service connection point must be in online mode. A server authentication certificate for the CMG. If using the Azure classic deployment method, you must use an Azure management certificate. Starting with Configuration Manager version 1802, Microsoft recommends using the Azure Resource Manager deployment model. It doesn't require this management certificate. The classic deployment method is deprecated as of version 1810. Other certificates may be required, depending upon your client OS version and authentication model. For more information, see CMG certificates. In version 1802, you must configure all CMG-enabled management points to use HTTPS. Starting in version 1806, when using the site option to Use Configuration Manager-generated certificates for HTTP site systems, the management point can be HTTP. For more information, see Enhanced HTTP. Integration with Azure AD is needed for Azure Resource Manager deployments. It may also be required for Windows 10 clients. For more information, see Configure Azure services. All Windows versions listed in Supported operating systems for clients and devices are supported for CMG. CMG only supports the management point and software update point roles. CMG doesn't support clients that only communicate with IPv6 addresses. Software update points using a network load balancer don't work with CMG. The following cost information is for estimating purposes only. Your environment may have other variables that affect the overall cost of using CMG. CMG uses Azure Cloud Services as platform as a service (PaaS). This service uses virtual machines (VMs) that incur compute costs. In Configuration Manager version 1706, CMG uses a Standard A2 VM. Starting in Configuration Manager version 1710, CMG uses a Standard A2 V2 VM. You select how many VM instances support the CMG. One is the default, and 16 is the maximum. This number is set when creating the CMG, and can be changed afterwards to scale the service as needed. For more information on how many VMs you need to support your clients, see Performance and scale. See the Azure pricing calculator to help determine potential costs. Virtual machine costs vary by region. Charges are based on data flowing out of Azure (egress or download). Any data flows into Azure are free (ingress or upload). CMG data flows out of Azure include policy to the client, client notifications, and client responses forwarded by the CMG to the site. These responses include inventory reports, status messages, and compliance status. Even without any clients communicating with a CMG, some background communication causes network traffic between the CMG and the on-premises site. View the Outbound data transfer (GB) in the Configuration Manager console. For more information, see Monitor clients on CMG. See the Azure bandwidth pricing details to help determine potential costs. Pricing for data transfer is tiered. The more you use, the less you pay per gigabyte. For estimating purposes only, expect approximately 100-300 MB per client per month for internet-based clients. The lower estimate is for a default client configuration. The upper estimate is for a more aggressive client configuration. Your actual usage may vary depending upon how you configure client settings. Performing other actions, such as deploying software updates or applications, increases the amount of outbound data transfer from Azure. Internet-based clients get Microsoft software update content from Windows Update at no charge. Don't distribute update packages with Microsoft update content to a cloud distribution point, otherwise you may incur storage and data egress costs. For any other necessary content, such as applications or third-party software updates, you must distribute to a cloud distribution point. Currently, the CMG supports only the cloud distribution point for sending content to clients. For more information, see the cost of using cloud distribution points. Each cloud service has a dynamic IP address. Each distinct CMG uses a new dynamic IP address. Adding additional VMs per CMG doesn't increase these addresses. For more information on CMG scale, see Size and scale numbers. If possible, configure the CMG, CMG connection point, and the Configuration Manager site server in same network region to reduce latency. The connection between the Configuration Manager client and the CMG isn't region-aware. Client communication is largely unaffected by latency / geographic separation. It is not necessary to deploy multiple CMG for the purposes of geo-proximity. Deploy the CMG at the top level site in your hierarchy and add instances to increase scale. For high availability of the service, create a CMG with at least two CMG instances and two CMG connection points per site. Scale the CMG to support more clients by adding more VM instances. The Azure load balancer controls client connections to the service. Create more CMG connection points to distribute the load among them. The CMG distributes the traffic to its connecting CMG connection points in a round-robin fashion. When the CMG is under high load due to more than the supported number of clients, it still handles requests but there may be delay. While Configuration Manager has no hard limit on the number of clients for a CMG connection point, Windows Server has a default maximum TCP dynamic port range of 16,384. If a Configuration Manager site manages more than 16,384 clients with a single CMG connection point, you must increase the Windows Server limit. All clients maintain a channel for client notifications, which holds a port open on the CMG connection point. For more information on how to use the netsh command to increase this limit, see Microsoft Support article 929851. You don't need to open any inbound ports to your on-premises network. The service connection point and CMG connection point initiate all communication with Azure and the CMG. These two site system roles must be able to create outbound connections to the Microsoft cloud. The service connection point deploys and monitors the service in Azure, thus must be online mode. The CMG connection point connects to the CMG to manage communication between the CMG and on-premises site system roles. The service connection point connects to Azure over HTTPS port 443. It authenticates using Azure AD or the Azure management certificate. The service connection point deploys the CMG in Azure. The CMG creates the HTTPS cloud service using the server authentication certificate. The CMG connection point connects to the CMG in Azure over TCP-TLS or HTTPS. It holds the connection open, and builds the channel for future two-way communication. The client connects to the CMG over HTTPS port 443. It authenticates using Azure AD or the client authentication certificate. The CMG forwards the client communication over the existing connection to the on-premises CMG connection point. You don't need to open any inbound firewall ports. The CMG connection point forwards the client communication to the on-premises management point and software update point. This table lists the required network ports and protocols. The Client is the device initiating the connection, requiring an outbound port. The Server is the device accepting the connection, requiring an inbound port. 1 The CMG connection point first tries to establish a long-lived TCP-TLS connection with each CMG VM instance. It connects to the first VM instance on port 10140. The second VM instance uses port 10141, up to the 16th on port 10155. A TCP-TLS connection performs the best, but it doesn’t support internet proxy. If the CMG connection point can’t connect via TCP-TLS, then it falls back to HTTPS2. 2 If the CMG connection point can’t connect to the CMG via TCP-TLS1, it connects to the Azure network load balancer over HTTPS 443 only for one VM instance. 3 If there are two or more VM instances, the CMG connection point uses HTTPS 10124 to the first VM instance, not HTTPS 443. It connects to the second VM instance on HTTPS 10125, up to the 16th on HTTPS port 10139. Specific Azure endpoints are different per environment depending upon the configuration. Configuration Manager stores these endpoints in the site database. Query the AzureEnvironments table in SQL Server for the list of Azure endpoints.